The rise of space junk orbiting the Earth could 'provoke armed conflict' as damage to military satellites could be misconstrued as an attack, a new report warned. Researchers at the Russian Academy of Sciences in Moscow said the debris had a "special political danger" because it is difficult to determine whether an operational satellite had been hit by the fragments or was intentionally attacked by another country. 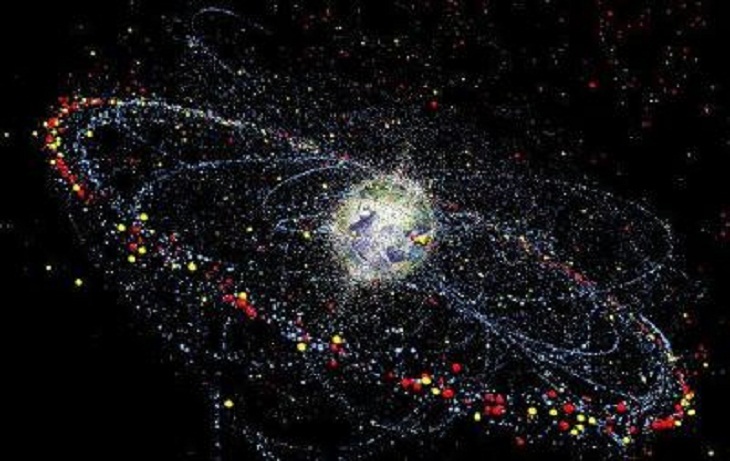 Space agencies in the US and Russia track thousands of pieces of space junk larger than 10cm but estimate there could be trillions of smaller pieces. Even the smallest piece of debris is capable of causing damage to spacecraft as they can collide at a combined speed of more than 30,000mph, the Guardian reports. Writing in a study for the journal Acta Astronautica, astrophysicist Vitaly Adushkin said such an incident "may provoke political or even armed conflict between space-faring nations". "The owner of the impacted and destroyed satellite can hardly quickly determine the real cause of the accident", he explained. The warning comes after a Russian satellite, Blits, was damaged in 2013 after colliding with debris created when China shot down an old weather satellite in 2007. The destruction of the satellite left 3,000 more pieces of debris in orbit.